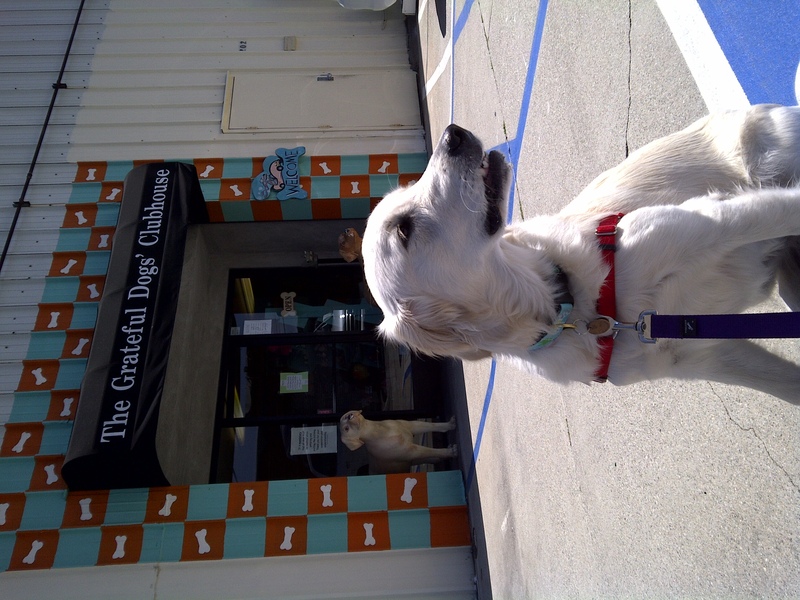 I went for my trial day at the grateful dogs clubhouse this morning at 8am…. I wasn’t happy about getting in the car because that’s when I get to take my first nap of the day. Right when everyone leaves for work and the house is quiet… I go back to sleep. Ah, the life of a dog. Needless to say I was swooped up and put into the back of the car for transport…. and finally I realized that I was being transported to the Grateful Dog Clubhouse. Apparently playing with other dogs is good for me as I grow up. My mom picked me up at about 1pm after I got to play for 5 HOURS! The people watching over me at Grateful Dogs told my mom that they were worried that I would wear myself out with playing, but I’m pretty sure that will never happen as I LOVE TO PLAY! They also thought that I got in over my head a little bit because I instigated playing with multiple dogs and when they all played back with me I got a little intimidated with all of the attention.